Counting the total number of websites nowadays is as difficult as counting the number of stars in the sky. It’s like a boon granted to the humanity and every human wants to take full advantage of that. But if we create a $1 coin 100 times, its value will also depreciate by 100 times and the same happens in this case. Due to the over-crowded web loaded with websites, many of them go unnoticed. Even finding a website with a rough idea about its domain is more difficult than finding an address on Google Maps. So if you want to stand out in the crowd, you need to have something extraordinary that others don’t have. Today I’m going to review a website that helps others to go with the same formulation. 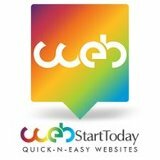 I am talking about Web Start Today, a web app that is a website building tool. As I have already told you that there are many websites in each niche and this one is no exception. But if I’m about to review this one, there must be something unique about it and yes, it’s quality! To start with them, just login with a valid email id and enter all your requirements like the category to which the site belongs and then choose a design from more than 1000 of them available. Up to this point, it’s almost the same as other cases. But from here the route changes to a whole new level. First, the quality of the designs is amazing. I mean if you hire yourself a designer, even then his quality would be questionable compared to this. Otherwise, pre-made template websites are also provided by Google but they are of almost no use. Then, you can customize these designs both text-wise or pictures as your requirements suit you. It would be quite amazing for you to know that all these brilliant designs that we talked about are available under the free plan. This is almost a dream come true for one who wants to launch a website of him but doesn’t have enough money to hire a designer neither has such technical knowledge to design it himself. There is just one limitation that the website will be made live on a sub-domain which would be something like (yourbusinessname.WebStartToday.com). But the paid plans are also very affordable starting at $9.99/month or $99/year. Though everything I discussed to this point is satisfying, yet it’s not a complete package for me and so for the developer. That’s why they have included an option to “hire a pro” where you can contact them directly and tell them your requirements so that they can give you a price. After looking at their work, I think that hiring a pro would also be a good option in case you want something “out of the box” for yourself. Pros: unique designs for free; no technical knowledge required; go live in minutes; affordable prices.